Coconut & Hibiscus Curl Enhancing Smoothie gives you soft, silky and defined curls! This conditioning enhancing smoothie smooths split ends and tames stray flyaways to transition damaged, over-processed hair to gloriously shiny, bouncy curls! 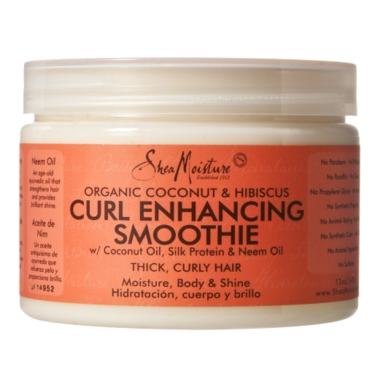 This Smoothie is an all-natural leave on styling cream specially formulated for wavy, curly hair. Cocos Nucifera (Coconut) Fruit Juice, Water, Glycerin (Vegetable), Cetearyl Alcohol, Butyrospermum Parkii (Shea) Butter, Cetrimonium Chloride, Polysorbate 60, Cocos Nucifera (Coconut) Oil, Oleth-10, Panthenol, PEG-150 Stearate, Steareth-20, Mangifera lndica (Mango) Seed Butter, Persea Gratissima (Avocado) Oil, Macadamia Ternifolia Seed Oil, Daucus Carota Sativa (Carrot) Seed Oil, Aloe Barbadensis Leaf Juice, Hydrolyzed Silk, Hibiscus Rosa-Sinensis Flower Extract, Tocopherol, Melia Azadirachta Seed Oil, Fragrance (Essential Oil Blend), Triethyl Citrate, Caprylyl Glycol, Benzoic Acid. My curls love this stuff! Ingredients are super clean and I always get compliments on how good my hair smells! I let out a little happy gasp the first time I tried this on my hair. It works amazing and smells divine. The trick is not to apply it too close to the roots so that the top of your hair is not weighted down. A little goes a long way, love the clean ingredients. Love the smell! Works well and is silicone free. Good ingredients! I really wanted to love this but it just makes my hair feel heavy and greasy. (I have thick, very wavy hair that is not super-curly so this is perhaps suited to people with very curly hair). The best product ever for my half african half caucasian daughter! This brand has awsome products. I had so much trouble finding these products in Canada. I'm super happy it is now available on Well.ca. Yay! I am so happy to find a Canadian retailer for this brand! My hair, thanks to an Indian father, is thick and curly and this is the only styling cream that I return to over and over again. Sadly, the price in Canada is nearly twice what it is the US but I cough it up for a silicone free curly-hair line that actually works.